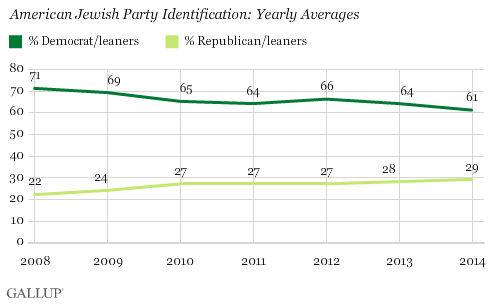 WASHINGTON, D.C. -- In 2014, 29% of Jewish Americans identified as Republicans or leaned Republican, little changed in recent years, but higher than in 2008. Meanwhile, 61% of American Jews identified as Democrats or leaned Democratic, down from 71% in the strongly Democratic year of 2008. The diminished Democratic skew among American Jews in recent years is slightly more pronounced than the same trend among all Americans. The percentage of the general population that identifies with or leans Democratic has fallen by about seven percentage points since 2008, compared with the 10-point drop among Jews. The percentage that identifies with or leans Republican among the general population is up three points, compared with the increase of seven points among Jews. These results are based on 2014 Gallup Daily tracking interviews with 4,116 Americans who identified their religion as Jewish. Jews in the U.S. are proportionately well-represented in Congress, with 28 members of the 535 House and Senate members in the new Congress identifying their religion as Jewish, meaning that about 5% of all House members and Senators are Jewish, compared with the 2% of the adult population. Of these Jewish members of Congress, all are Democrats or independent, with the one exception being newly elected Republican Rep. Lee Zeldin of New York. 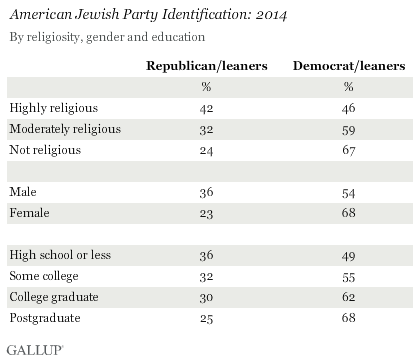 As is the case with other Americans, Jewish Americans' political leanings vary significantly by religiosity, gender and education. Jewish men are more Republican than Jewish women, highly religious Jews are more Republican than less religious Jews, and Jews with lower levels of education are more likely to be Republicans than those with more formal education. All of these patterns among the Jewish population reflect those evident in the overall U.S. population. The Democratic skew among women is well-established, highly religious Americans are more Republican than those who are less religious, and Americans with postgraduate educations are more likely to be Democratic than those with less education. There are few systematic differences in party identification in the Jewish population across age, income or region of country. The general Democratic orientation of American Jews is a well-established political fact, although this Democratic slant has decreased marginally in recent years, as it has among the general U.S. population. 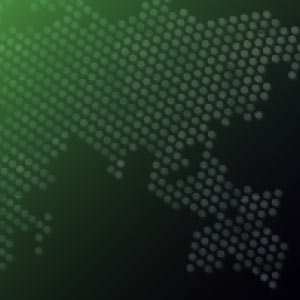 Given the small sample sizes of the Jewish population in traditional surveys, it is difficult to determine precisely those issues on which Jewish Democrats nationally may differ from Jewish Republicans, although most news accounts suggest that U.S. relations with Israel is certainly one of them. The Jewish Republican minority in the U.S. is politically active, including the efforts of the Republican Jewish Coalition, which will hold its national leadership reception in Washington, D.C., on Jan. 6 with prominent Republican members of Congress expected to be in attendance. The direct influence of Jewish Republicans in Congress may be lessened with the departure of former House Minority Leader Eric Cantor, who was defeated in his Virginia Republican primary election last year. Results for this Gallup poll are based on telephone interviews conducted Jan. 2-Dec. 30, 2014, on the Gallup U.S. Daily tracking survey, with a random sample of 4,116 adults who identify their religion as Jewish, aged 18 and older, living in all 50 U.S. states and the District of Columbia. For results based on the total sample of Jewish adults, the margin of sampling error is ±2 percentage points at the 95% confidence level. All reported margins of sampling error include computed design effects for weighting. There is little sign that President Obama is suffering disproportionately in support among Jews; 54% approved of his job performance from Aug. 1-Sept. 15, 13 points higher than his 41% approval among all Americans. This is essentially the same as the 14-point approval gap seen throughout his term.